The National Longitudinal Transition Study (NLTS) provided the first national picture of the lives of youth with disabilities in their high school years and in their transition to early adulthood. NLTS analyses from the early 1990s showed tremendous variation across disability categories in the experiences and achievements of youth, yet the outcomes of youth in the primary disability category of emotional disturbance (ED) were found to be “particularly troubling” (Wagner et al., 1991, p. 11:3). 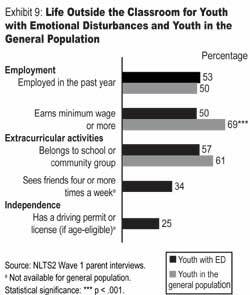 Youth with ED demonstrated a pattern of disconnectedness from school, academic failure, poor social adjustment, and criminal justice system involvement, although there were positive findings regarding other aspects of their lives, such as employment (Wagner, 1995). The potential social costs of poor outcomes among these youth spurred new policies, programs, and interventions to improve their prospects for a successful transition to adulthood. A National Agenda for Achieving Better Results for Children and Youth with Serious Emotional Disturbance (Chesapeake Institute, 1994) was one reflection of that increased national attention, as were amendments to the Individuals with Disabilities Education Act (IDEA) in 1990 and 1997, and research priorities established by the Office of Special Education Programs of the U.S. Department of Education. The National Longitudinal Transition Study-2 (NLTS2) (see footnote 1) provides an opportunity to take another look at youth with ED. How have their experiences changed in the years since NLTS? This Data Brief takes a fresh look at selected characteristics of youth with ED and their households that distinguish them from other youth with disabilities and/or from youth in the general population. It also describes aspects of their school histories and their current school programs and experiences, as well as indicators of their academic performance and social adjustment at school. Finally, the activities of youth with ED outside of school are highlighted. Secondary school youth with ED differ from the general population of youth in many ways other than their disability—differences that can help in understanding their outcomes. For example, more than three-fourths of youth with ED are male (Exhibit 1). Thus, conditions that are more common among young men, such as criminal justice system involvement (Snyder, 2002), are likely to be more common among youth with ED than the general population, apart from any effects of their disabilities. Youth with ED also have a cluster of other characteristics that are associated with poorer outcomes in the general population, including a higher likelihood of being African American, living in poverty, and having a head of household with no formal education past high school. Youth with ED also are less likely to have the advantages of a two-parent household than their nondisabled peers. 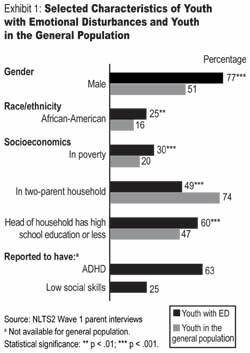 Further, almost two-thirds of youth with ED are reported by their parents to have attention deficit or attention deficit/hyperactivity disorder (ADHD), with its associated impacts on behavior. One-fourth of youth with ED are rated low by parents on a scale of social skills (see footnote 2), which could be expected to influence relationships both in and out of school. Not only do youth with ED face the challenges of poverty and other risk factors to a greater extent than the general population of youth, but many also bring a troubled history with school to their high school experiences (Exhibit 2). More than half of secondary school youth with ED did not begin receiving special education services until age 9 or older. This is a much higher rate of beginning services at this age than youth with disabilities as a whole, largely because youth with ED tend to have their disabilities identified later. Youth with ED also experience greater school mobility than other youth with disabilities; 40% have gone to five or more schools since starting kindergarten—more than the three schools typically attended in the grade-level progression from elementary to middle school and middle to high school for students in the general education population. This mobility can be associated with considerable disruption to their school programs and their relationships with adults and other students at school. Academic challenges can result; 38% of youth with ED have been held back a grade at least once in their school careers, according to parents. A history of social adjustment issues also accompanies many youth with ED to high school—almost three-fourths of them have been suspended or expelled at least once, a rate more than twice that of youth with disabilities as a whole. These experiences may contribute to the fact that youth with ED are more likely than youth in any other category to have parents report that their child’s last school change was made because he or she was reassigned to a different school by the school district, not because of a family move or other personal choices. Course-taking. When youth with ED reach secondary school, their academic course schedules closely resemble those of youth in the general population (Exhibit 3). Nearly all secondary school youth with ED take language arts, math, and social studies in a given semester, and 84% take science. Only a foreign language is taken at a markedly lower rate by youth with ED than youth in the general population. A comparison between youth represented in NLTS2 and those represented in NLTS (see footnote 3) shows a notable increase in the academic focus of courses taken by youth with ED. There has been a 13-percentage-point increase in their taking science and social studies and an 11-percentage-point increase in their taking a foreign language, a course often required for college admission. Thus, youth with ED in the 21st century are taking high school courses that better prepare them for postsecondary education. 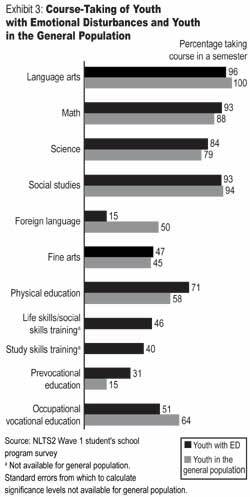 Several nonacademic courses also are part of the typical course schedules of youth with ED in a given semester, including physical education (71%) and occupationally specific vocational education (51%). However, youth with ED are less likely to be taking occupationally specific vocational education than students in the general population (64%), even though such training has been shown to contribute to higher rates of postsecondary vocational training and competitive employment for youth with high-incidence disabilities (Wagner, Blackorby, Cameto, & Newman, 1993). In contrast, youth with ED are more likely than those in the general population to take prevocational education. Rates of vocational course-taking by youth with ED have not changed appreciably since the mid-1980s. Between 40% and 47% of youth with ED take fine arts, life skills, and study skills courses in a semester. The percentage of youth with ED who take a fine arts course has increased by 13 percentage points over time, with life skills course-taking increasing by twice that much (26 percentage points) since the mid-1980s. Instructional settings. Not only do the types of courses youth with ED take closely mirror those of youth in the general population, youth with ED are quite likely to be taking many of their courses in general education classrooms (Exhibit 4). There is an increase of more than 10 percentage points in the percentage of youth with ED taking science, social studies, and foreign language in a general education setting since the mid-1980s. However, youth with ED experience educational instruction in a general education setting to a lesser degree than youth with disabilities as a whole. More than three-fourths of youth with ED take at least one general education class (compared with 88% for youth with disabilities as a whole), and 22% take all their courses in general education classrooms (compared with 27% for youth with disabilities as a whole). On average, youth with ED take half of their courses in general education classrooms (compared with 60% of their peers with disabilities as a whole). 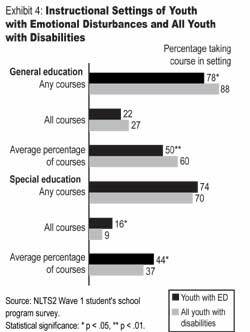 Special education classes also are included in the course schedules of the majority of youth with ED—about three-fourths take special education classes. This is a decline of 15 percentage points since the mid-1980s in the proportion of youth with ED who receive instruction in special education classes. Although 44% of the courses youth with ED take are special education classes, on average, 16% of youth with ED take all of their courses in special education settings (compared with 9% of youth with disabilities as a whole who take only special education courses). Student supports. Youth with ED receive a variety of services and supports to help them manage their behavioral issues at school (Exhibit 5). According to school staff, 55% of youth with ED have a behavior management plan or participate in a behavior management program, half receive behavioral interventions, and a similar percentage receive mental health services. In fact, comparisons of findings from NLTS and NLTS2 show a 20-percentage-point increase in youth with ED receiving mental health services from or through their schools. 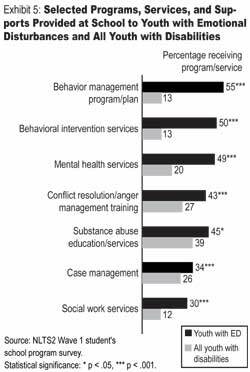 Substance abuse education or services are provided to 45% of youth with ED, and 43% take part in a conflict resolution or anger management program. Case management and social work services are provided to 34% and 30% of youth with ED, respectively. Each of these services or supports is provided significantly more often to youth with ED than to youth with disabilities as a whole. 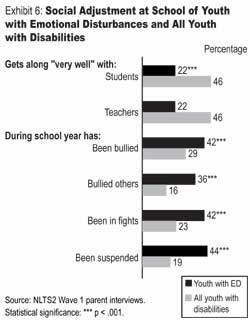 Despite these supports, secondary-school-age youth with ED face more challenges in getting along at school than other youth with disabilities (Exhibit 6). Their parents are only about half as likely as parents of youth with disabilities as a whole to say their adolescent children with ED get along “very well” with teachers or other students at school. In fact, 28% are reported to get along with other students “not very well” or “not at all well,” and 26% have those levels of difficulty getting along with teachers. Youth with ED are more likely than those with disabilities as a whole to be involved in bullying or fighting while coming to, being at, or going from school, either as victims or as perpetrators. During a school year, 42% of youth with ED are reported by parents to be involved in fights, and a similar percentage is reported to be bullied. More than one-third (36%) are reported by parents also to be perpetrators of bullying. These behaviors may contribute to the high rate at which youth with ED are subject to disciplinary actions at school, including suspensions or expulsions; 44% are reported by parents to have been suspended in the current school year, which is more than twice the rate of suspensions of youth with disabilities as a whole (19%). Youth with ED also experience academic difficulties at school. Although on average, their reading and mathematics abilities are closer to grade level than those of youth with disabilities as a whole, they are more likely to receive poor grades. 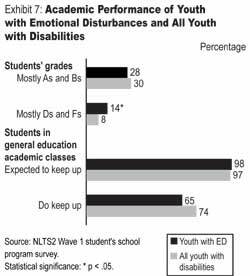 Fourteen percent of youth with ED receive “mostly Ds or Fs” according to school staff; only 8% of youth with disabilities as a whole receive those low grades (Exhibit 7). Further, nearly all youth with ED who take general education academic classes have teachers who report they are expected to keep up with other students in class, although only about two-thirds actually are reported to do so. With their children’s difficult experiences at school, both past and current, it is not surprising that parents of youth with ED are more likely to report dissatisfaction with their children’s schools and school programs than parents of youth with disabilities as a whole (Exhibit 8). Twenty-nine percent of youth with ED have parents who report being “somewhat dissatisfied” or “very dissatisfied” with their children’s schools, and 22% have parents who report similar levels of dissatisfaction with their special education services, compared with 20% and 16% of youth with disabilities as a whole. Parents of youth with ED also are more likely than parents of youth with disabilities as a whole to report that obtaining the services needed by their children with ED took “a great deal of effort.” Thirty percent of youth with ED have parents with that perspective, compared with 19% of students with disabilities as a whole. Dissatisfaction with the usefulness of the transition planning process to prepare youth for life after high school also is more prevalent among parents of youth with ED. 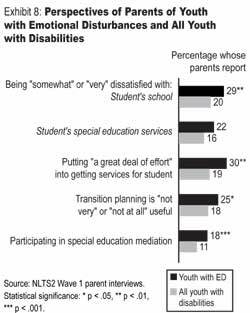 One in four have parents who report that transition planning is “not very useful” or “not at all useful,” significantly more than the 18% of students with disabilities as a whole whose parents report this view. These more negative perspectives on the part of parents of youth with ED may contribute to the fact that they also have a higher rate of participation in special education mediation with their children’s schools or their school districts than parents of youth with disabilities as a whole (18% vs. 11%). Although many youth with ED face challenges at school, the quality of their lives is shaped by more than their school experiences. Friendships, extracurricular activities, and employment can be important for all adolescents, but they may be particularly important for youth with ED because they can provide opportunities for developing positive relationships and recording achievements that may be difficult to experience at school. Life outside of school for youth with ED resembles in many ways that of youth in the general population (Exhibit 9). More than half of secondary-school-age youth with ED (53%) hold a regular paid job in a one-year period, an employment rate very similar to that of the general population of youth (50%). And half of working youth with ED earn minimum wage or more at their jobs, an increase of 33 percentage points in youth earning minimum wage or more since NLTS. Nonetheless, working youth with ED are less likely to earn that amount than their nondisabled peers. Additionally, youth with ED are about as likely as youth in the general population to belong to organized extracurricular groups at school or in the community, such as a sports team, performing group, or religious youth group. More than half of youth with ED (57%) belong to such groups. They also have quite active friendships, with about one-third of youth seeing friends outside of class and in organized group activities four or more days a week. However, these frequent informal friendship interactions may be cause for concern. The original NLTS demonstrated that youth who see friends frequently outside of school have significantly higher rates of absenteeism and course failure than youth with disabilities who have somewhat less active friendships. In turn, high absenteeism and course failure rates contribute to a higher likelihood that youth with disabilities will drop out of high school (Wagner, 1991). In 1991, NLTS examined the secondary school and early adult experiences and outcomes of youth with disabilities and asked the question “How are they doing?” Findings at that time pointed to “a mixed bag of transition experiences” (Wagner et al., 1991, p. 11:1). The present examination of the characteristics, experiences, and outcomes of secondary school youth with ED suggests a similar picture of accomplishments and of causes for concern. Changing school programs reflect increasingly rigorous course-taking in general education settings and increased services and supports to help students succeed, suggesting that students with ED may be better prepared to complete high school and to pursue postsecondary education. 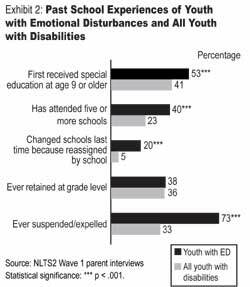 At the same time, youth with ED have a pattern of difficult experiences associated with school throughout their school careers, and they have parents who express dissatisfaction with their children’s schools and school programs more frequently than parents of youth with disabilities as a whole. Analyses of future waves of data from NLTS2 will explore the ways in which these high school experiences of students with ED, as well as youth with disabilities as a whole, help shape their achievements in early adulthood. Chesapeake Institute. (1994). National agenda for achieving better results for children and youth with serious emotional disturbance. Washington, DC: Author. Gresham, F. M., & Elliott, S. N. (1990). Social Skills Rating System Manual. Circle Pines, MN: American Guidance Service. Snyder, H. N. (2002, November). Juvenile arrests 2000. Juvenile Justice Bulletin. Washington, DC: U.S. Department of Justice, Office of Juvenile Justice and Delinquency Prevention. Retrieved April 13, 2004, from http://www.ncjrs.gov/html/ojjdp/jjbul2002_11_1/contents.html. Wagner, M. (1995). Outcomes for youths with serious emotional disturbance in secondary school and early adulthood. The Future of Children, 5(2), 90–112. Wagner, M., Newman, L., D’Amico, R., Jay, E. D., Butler-Nalin, P., Marder, C., et al. (1991). Youth with disabilities: How are they doing? Menlo Park, CA: SRI International. Wagner, M., Blackorby, J., Cameto, R., & Newman, L. (1993). What makes a difference? Influences on postschool outcomes of youth with disabilities. Menlo Park, CA: SRI International. NLTS2 has a nationally representative sample of more than 11,000 youth who on December 1, 2000, were ages 13 through 16, receiving special education, and in at least seventh grade. More than 1,000 youth in the disability category of emotional disturbance are included in the sample. Information from NLTS2 is weighted to represent youth with disabilities nationally as a group, as well as youth in each federal special education disability category. The information reported here was gathered from parents/guardians of NLTS2 youth in telephone interviews or through mail questionnaires in 2001 and from mail surveys of staff in schools attended by NLTS2 youth in the 2001-02 school year. More information on NLTS2 is available at http://www.nlts2.org. Eleven items comprise this scale, most taken from the Social Skills Rating Scale (Gresham & Elliott, 1990). The original National Longitudinal Transition Study (NLTS) was conducted from 1984 to 1993. All comparisons between NLTS and NLTS2 are taken from Wagner, Cameto, and Newman (2003).